I made this sweater from scratch. It’s a bottom up raglan, knit in one piece to the arms. I knit the sleeves individually and joined all the pieces on one circular, decreasing at the raglans and front neck until the yoke was okey-dokey. I eyeballed the decreases and adjusted as I went. I was aiming for a shoulder and sleeve that are fitted but not tight. I hate it when my armpits are strangled. 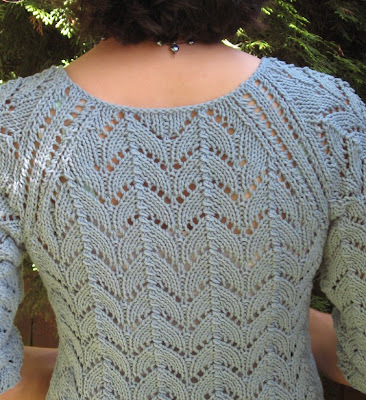 The stitch pattern is horseshoe lace. I threw in a few rows of straight stitch at each “side seam” to give me the right width. The front edges are a 4-stitch eyelet pattern. I picked up stitches around the front and bound off purl-wise. This gives the edges a firm, neat finish. I thought the neck might stretch out, but on its test-drive, it was fine. Horseshoe lace is very easy and looks cool. It doesn’t look much like horseshoes to me. The curves bisected by the ridged spine remind me of a fossilized something or other. I didn’t want to think about waist shaping and interrupting the stitch pattern, so I went down one needle size in the midsection. This, along with negative ease, gives the cardigan shape. The width is 2” narrower than my chest measurement. Lace is stretchy, and looks good when it’s “opened.” So, I figured negative ease was the way to go. I also wanted the look of an A-line without the extra width at the bottom. Leaving the bottom half of the front open, gives me that nice triangular shape. The lacing was an afterthought. It's a crocheted chain. Needle: Size 7 & 8 circulars and a crochet hook. This is so lovely! Might you be tempted to share the pattern? It's just random kid stuff, now, but eventually I'm going to put some of my knitting up there, as soon as I finish a presentable project. I added your blog to the list on my page, if you don't mind! 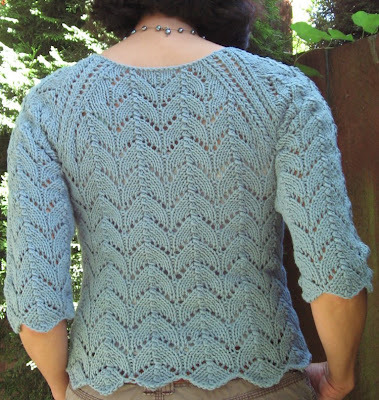 Wow, I just saw this on Ravelry (I'm seachange) and I faved it. It is really, really beautiful. I can't follow patterns to save my life, but I may try to copy it visually. (IRL, since it takes me forever to do a pair of socks probably not, but still, I would mean to because it is so beautiful. I apologize for raving, but I hardly ever like something this much. Oh, if you are planning to sell this as a pattern I would buy one. I don't want to poach your idea or anything. very cute, can't wait to have the pattern! its great. i would buy this pattern!!! Are you planning on publishing this pattern? I really want to knit this! Gorgeous! You have a talent for design!